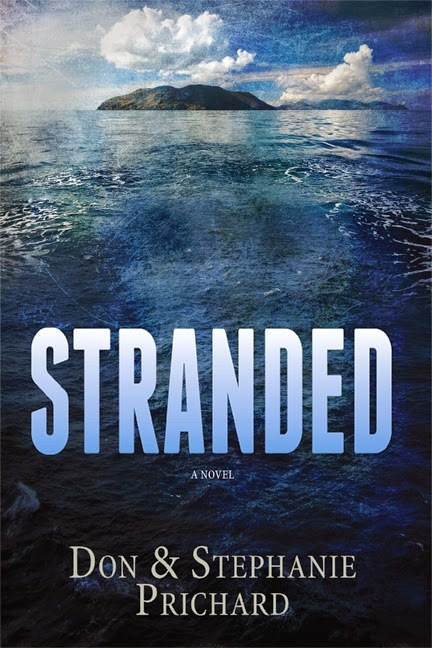 Don and Stephanie Prichard are the authors of the suspense novel Stranded. Don and I joke that we're co-authors and still happily married. We started our debut novel about ten years ago and have found it hugely rewarding. Don is a retired architect and a Viet Nam veteran who served in the US Marine Corps Reserves for thirty-two years before retiring as a colonel. I'm an army brat and have lived in many countries around the world and loved it. Readers who like a fast-paced story of survival with lots of suspense and a spiritual dimension. What inspired you to write a book about a struggle to survive on a jungle island? Don came up with the basic story by asking himself what gut-wrenching event would test a man's heart and soul. From there, he worked backwards to the beginning of the story. I love survival stories, so when he asked me to join him to "bring the characters to life," I jumped in with glee. Tell us about the two protagonists, Jake Chalmers and Eve Eriksson. Jake is devastated when he fails to save his wife's life, so he is determined to protect the three other castaways' lives. As a Marine Corps reservist, he is well qualified. Eve, however, has a different agenda--get off the island, at whatever the cost. It’s hard for a lot of readers living in the comfort of their homes to imagine the hostile environment of the jungle. How do you capture the challenges of surviving in the jungle for readers? Through using the five senses to bring home the experience. We want the readers to feel the grit of sand under their feet, the stench of their swampy armpits, and the pounding of their hearts as the snout of a croc nips at their heels. Oh yah, readers love it! Are there any writers who have influenced your writing style? I studied novels like The Hunger Games to learn how to write a page-turner. We've been delighted at the demand for a sequel to Stranded, so that's tapping off our keyboards now. What is one of your favorite quotes from Stranded? So thirsty. The craving ground like fine sandpaper against every cell in his body. Forty-two years old and he'd never experienced misery like this, not even in Nam. He raised his arm and flexed his fingers, blinked until the crinkled skin on the back of his hand came into focus. Were the wrinkles a symptom of dehydration? Or the result of floating five nights in the ocean? He'd count, clear the haze from his mind. Count the days since he'd boarded the cruise ship. The days alone on the ocean after the explosion. The hours, the minutes, every second of the rest of his life he'd spend hunting down Captain Emilio. He sat up, catapulted by the heat of rage. The boat fragment jerked, and he fell on his back and slid, grasping with outflung arms at the wet surface. The ocean swallowed his feet, his chest. The bucking craft smacked his head as he slipped off. Blood filled his mouth, stinging his tongue where his teeth slashed it. He caught the edge of the vessel, pulled, up, and spat. Crimson dots spattered the craft's white paint. He repositioned his grip and willed himself not to leg go. Willed himself to fill his lungs and release the air in a slow exhale. Willed himself to crawl back onto the broken sea vessel. He lay on his stomach and stretched his limbs into a sprawl. God and man may have abandoned him, but he wouldn't yield body and soul easily. The ocean would have to wait.